Need RGB LEDs in your processor cooler on the cheap? Spartan introduces the 3 PRO RGB HE1024, a new model with four direct-touch copper heatpipes, an aluminium fin array, and a 100mm Sigma Pro RGB PWM fan that can be controlled via motherboard RGB headers. Alternatively, you can also control the RGB LEDs via the included Nano RGB controller. The heatsink measures 110 x 82mm x 135mm and weighs 476g. It's compatible with all recent desktop platforms from AMD and Intel, with exception of the HEDT platforms. It's rated at up to 150W TDP. The product is sold in Europe for 23.90EUR (incl. VAT). The European brand SilentiumPC presents the new Spartan 3 PRO RGB HE1024 as a cost-effective alternative to stock CPU coolers, which is intended for professional system builders and DIY projects on a budget. 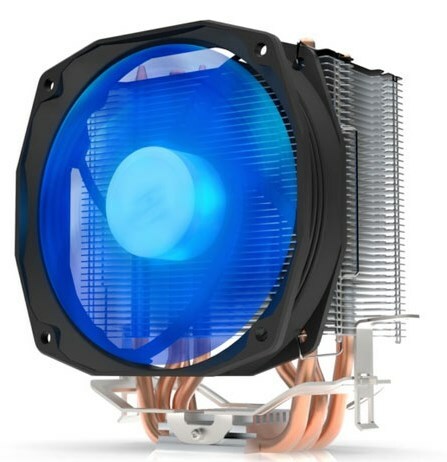 This extremely compact and lightweight cooler utilizes four 6 mm Heatpipes and aluminum heatsink for excellent cooling performance and oversized Sigma PRO RGB 100 PWM-controlled fan for quiet operation. Its new RGB Illumination system lights up the fan with stunning yet discreet colors and effects. All the major motherboard RGB systems are supported, including Asus™ Aura, ASRock™ RGB LED, EVGA™ RGB and MSI™ Mystic Light as wells as manual control via the included Nano RGB controller, making the Spartan 3 PRO RGB a ready-to-go RGB solution. In spite of its compact size and lightweight at 476 g, efficient heat transfer and dissipation is assured. This has been achieved thanks to its four high performance Heatpipes with 6 mm diameter and by implementing the HE technology, where the Heatpipes are in direct contact with the CPU heat-spreader. SilentiumPC offers the Spartan 3 PRO RGB with a pre-installed Sigma Pro RGB 100 mm fan. Being a PWM-controlled fan, it is able to operate at a wide fan speed range from 800 to 2.000 RPM. This feature allows the users to tweak the fan curve using the motherboards towards full performance or silence. Installation of the CPU cooler is extremely easy and does not require any tools during the process. All that has to be done, is simply to apply included high-conductivity Pactum PT-1 thermal compound on the CPU, put the mounting bracket into the motherboard and lastly clip the Spartan 3 PRO RGB on.